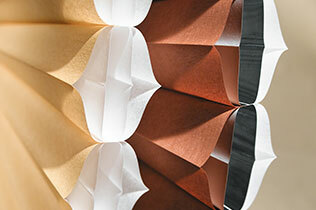 The beauty of honeycomb shades is the amount of light control that you can manage in your chosen room or space. The standard Honeycomb shade is made to draw the shade up from the bottom. You may choose to upgrade to a top-down/ bottom-up, or top-down feature which allows you to control your privacy and light. 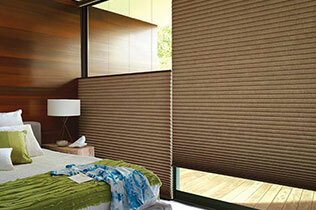 Honeycomb shades also come in room darkening fabrics which are perfect for bedrooms. Duette Architella Honeycomb Shades by Hunter Douglas have been proven to provide the best insulation for your home with their patented cell within a cell design. Up to 40% of an average homes heat is lost through the windows during the winter months. These Shades reduce that loss by an incredible margin. Top-Down Bottom-Up feature allows light to come into the room without sacrificing privacy. These shades are also cordless for a cleaner look and with safety in mind. Motorized shades area always a good choice especially for hard to reach windows. They can be individually programmed to open and close at certain times a day. With Hunter Douglans Powerview motorization, Boise Blinds is offering the most advanced motorized shades in the Treasure Valley. Motorize or Power lift systems with remote control or wall switching. 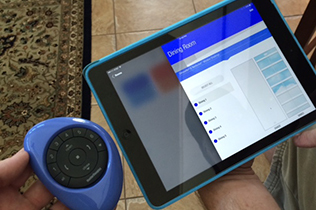 Hunter Douglas PowerView allows you to control motorized shades from anywhere in the world via the ipad app.